Swordsmen militia are levied troops whose task is to garrison and defend settlements. 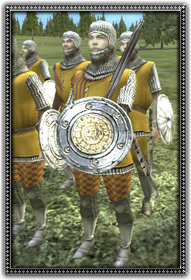 Better trained and equipped than peasant militia, these troops are armed with swords and protected by light armour and a shield. Useful for dealing with archers and other light infantry.